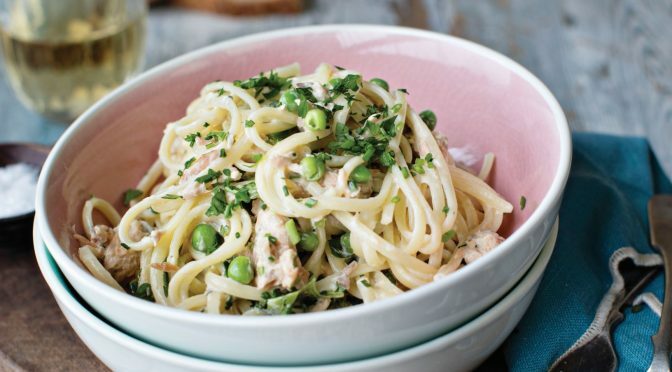 If you’re looking for a quick, healthy, supper dish, look no further than this Linguine Smoked Trout and Petit Pois recipe from novelist Tara Heavy in Fishwives, A Cookbook from Goatsbridge. Tara has published six novels, writes a blog and facilitates creative writing courses in the south-east of Ireland. She says she’s not a cook, but she can cook at least one great fish dish! 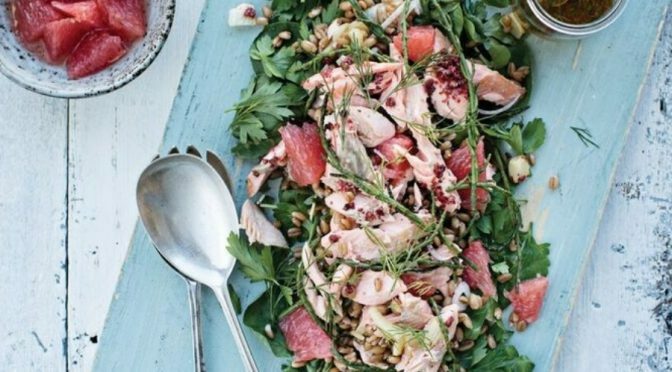 You can find Tara’s original version on page 72 in the cookbook, along with 77 more fish and trout inspired recipes from women across Ireland. All the profits from the sale of Fishwives head to an amazing charity called Hospice Africa Uganda. The book is available from select bookstores or online. Add a pinch of salt to a large pot of water and bring to the boil. Add the linguine and simmer for 11 minutes, stirring occasionally to avoid clumping together. Test the pasta after nine minutes – if there’s still a bit of a bite, add the peas and cook for two to three minutes until the pasta and peas are both cooked. Drain, reserving three to four tablespoons of the pasta water in a jug, then return the pasta and peas to the pot and reduce the heat to the lowest-setting. Add the flaked trout to the pasta and peas along with the crème fraîche and herbs and stir well. If the sauce is too thick, use some of the reserved cooking water to thin out to your preferred consistency. Season with some freshly ground pepper and serve in warm bowls – this does cool very quickly. Gluten-free doesn’t necessarily mean unimaginative! The latest recipe we’re adding to our online library from Fishwives, A Cookbook from Goatsbridge was provided by Tracy Hamilton who started Mash Direct with her husband Martin. They grow, steam and cook a large range of vegetables at their family farm and create culinary dishes that are sold in Supermarkets in the UK and Ireland, as well as exported to Dubai and Abu Dhabi. 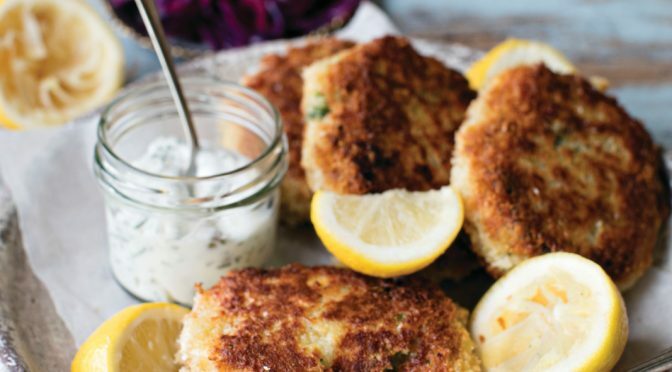 You can find Tracy’s original version on page 66 in the cookbook, along with 77 more fish and trout inspired recipes from women across Ireland. All the profits from the sale of Fishwives head to an amazing charity called Hospice Africa Uganda. The book is available from select bookstores or online. Steam potatoes in their skins until tender, around 20 minutes. Place butter and a drizzle of olive oil in a pan over a medium heat and allow to melt. When slightly bubbling, add the crushed garlic and sweat until translucent but not brown. Add the sliced spring onions and dill and toss until coated in the garlic butter; remove from the heat and add the zest of the lemon and season to taste. Once the potatoes are cooked, allow to cool and remove the skins by scraping with the back of a butter knife. Place the potatoes in a large bowl and crush roughly with a fork. Add the trout, the lemon zest, herb-butter mix and flour. Stir gently until all the ingredients are well mixed. Form handfuls (150g/6oz) of the mixture) into circular cakes, ten in total. Refrigerate the cakes for about 15 minutes and heat a deep fat fryer to 190°C/375°F. While the cakes are chilling, set out a shallow bowl of flour (for dusting), a shallow bowl of the beaten eggs and a shallow dish of crumbs. Remove the cakes from the fridge. Dust the cakes in flour, then dip them into the egg, allowing excess liquid to drip off, and then coat in the gluten-free crumb. Fry in batches cooking for six to nine minutes (depending on the thickness of the cakes) until heated through. Enjoy and serve – a good accompanying side dish would be Mash Direct Red Cabbage and Beetroot as its sweet/sour flavour profile would complement the smokiness of the cake. 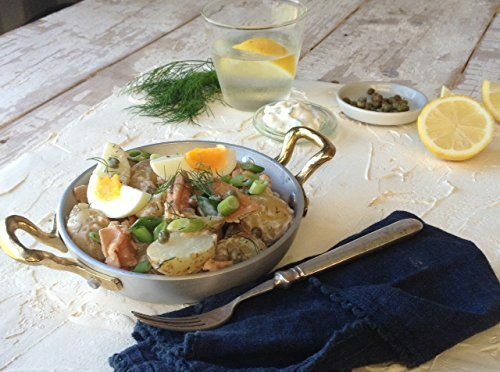 The featured recipe this month of warm potato salad with smoked trout, capers & lemon mayo comes from Kristen Jensen, co-author of Sláinte: The Complete Guide to Irish Craft Beer and Cider (2014), and Secretary of the Irish Food Writers’ Guild. You can find Kristen’s original version on page 80 of Fishwives, a cookbook by Goatsbridge, available from select bookstores or online. Place the potatoes in a saucepan and cover with cold water and a pinch of salt. Bring to the boil, then reduce the heat and simmer for about ten minutes, until the potatoes are cooked through and tender when pierced with the tip of a knife. Drain well and allow to cool slightly – just so they stop steaming. Meanwhile, whisk together the mayonnaise, lemon juice, dill and a pinch of salt and pepper in a small bowl. Transfer the warm potatoes to a mixing bowl and pour over the lemon mayonnaise, stirring to coat the potatoes evenly. Thinly slice the spring onions on the diagonal, including the green tops. Add to the potatoes along with the capers and stir together. Divide the potato salad between two shallow bowls and scatter the flaked trout and chopped hard boiled eggs, if using, on top. Season with another pinch of salt and pepper and serve while the potatoes are still warm. Our third fishwife in Fishwives – A Cookery Book from Goatsbridge is Bibi Baskin, former TV presenter on Ireland’s national broadcaster, RTE. The first woman in Ireland to have her own TV chat show, Bibi has also worked on both radio and TV with BBC and ITV in the UK. After a career in media, she moved to south India where she converted a dilapidated landmark building in the coastal town of Kerala into a Heritage Hotel. There Bibi developed a love of Indian cooking. She currently divides her time between Ireland and India. 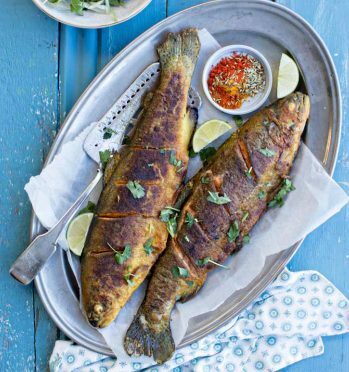 We’re thrilled that Bibi shared this Pan-fried trout with Indian spices recipe with us for the cookery book, where all profits from the sale are going to the Hospice Africa Uganda charity. If you’re looking for inspiration on how to cook trout, there are many more recipes in the book that’s available from our online store. Combine the flour, spices, lime zest and seasoning in a bowl and give a quick stir. Pre-heat the oven to 180°C/350°F/gas 5. Put some grease proof paper on a tray large enough to fit your trout. Meanwhile, heat a splash of oil or several spoons of ghee in a large frying pan over a medium to high heat. When the oil in the pan is hot, add the spiced fish and fry for two to three minutes until golden on one side. Turn over the fish and do the same to the other side. Bake for ten minutes. 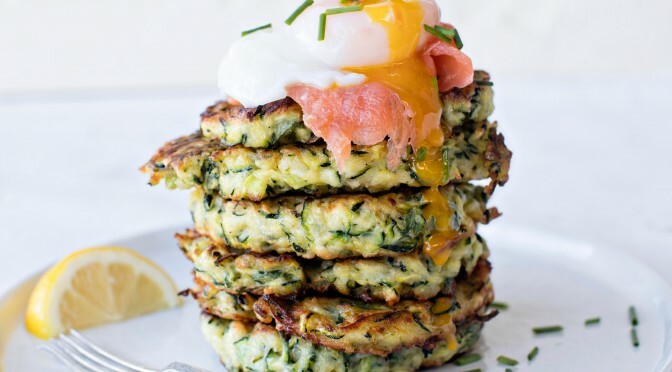 Serve with your favourite green salad and maybe add a little finely sliced fennel for extra crunch. 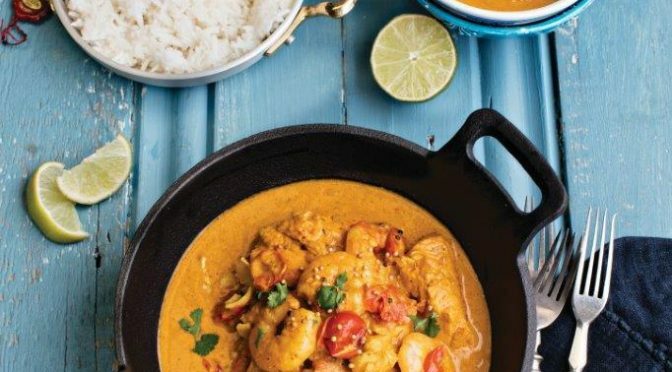 Note: The quantity of spices for this recipe have been checked by Ireland’s top Indian chef, Sunil Ghai from Pickle Restaurant, Dublin. 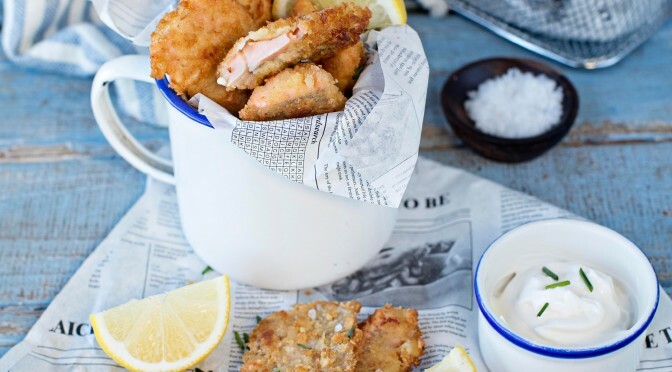 This month’s quick and tasty Trout Goujons with Aïoli recipe in Fishwives ~ A Cookbook by Goatsbridge, was submitted by Denise Walsh, our hardworking and dedicated Project Manager. 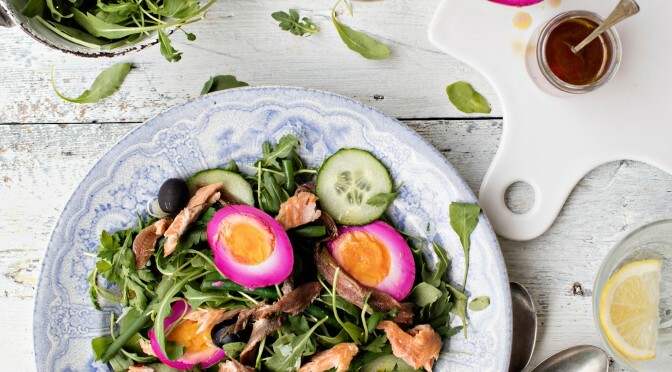 Denise is a graduate of the world-famous three month Ballymaloe cooking course and she’s a passionate home cook who now helps us dream up many ways to cook and eat Goatsbridge trout. We hope you’ll enjoy this quick and easy recipe as much as we do. Preheat the oven to 130ºC/250ºC/gas mark ½. To make the aïoli, place the egg yolks into a medium sized bowl. Combine the sunflower oil and olive oil in a measuring jug. Whisk the salt, mustard, white wine vinegar and crushed garlic into the yolks. Lay a tea towel on the counter and place the bowl on top. Taking a whisk in one hand and the jug of oil in the other, gradually drip the oil onto the yolks while whisking continuously; after a minute, they will begin to thicken. Do not rush or you will curdle the eggs. Any leftover aïoli will keep for a week covered in the fridge. Cut the trout length ways, checking for bones. If you find some bones you can trim them off. Then cut each strip into three pieces, approximately 4 cm (1½ in) in length. Place the seasoned flour in a wide dish, place the egg in another dish and finally the breadcrumbs in a third dish. Toss the trout strips in the flour first, shake off any excess, then dip in the beaten eggs and finally toss in the breadcrumbs until coated. Heat the oil in a deep-sided saucepan or a deep fat fryer until it reaches 200ºC/390ºF. Deep fry in batches, three to five at a time, until golden. Remove with a slotted spoon and place in the preheated oven to keep warm. 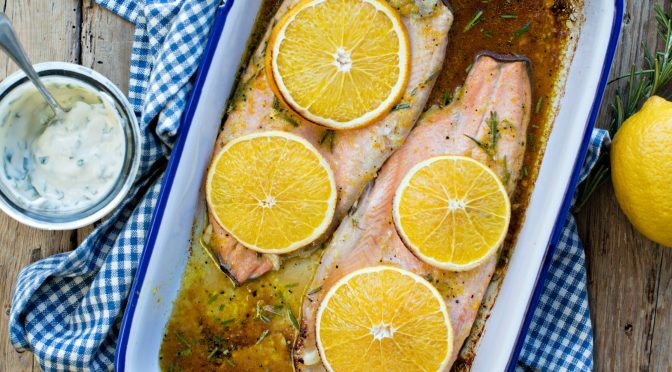 When all the trout has been cooked, pile onto warmed plates and serve with the aïoli and a green salad.